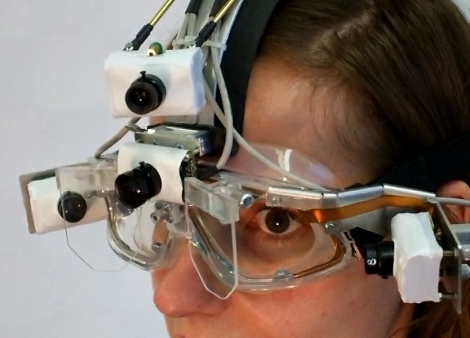 The EyeSeeCam is a rig that attaches to your noggin and points a camera wherever your gaze falls. There’s actually four cameras involved here, one to track each eye via a reflecting piece of acrylic, one as your third eye, and finally the tracking camera above that. There are some legitimate medical uses for this type of technology, but we enjoyed seeing some of the videos that [Johannes Vockeroth] put together showing everyday activities. We’ve embedded several clips after the break including an example of reading a book while wearing the apparatus. The third eye camera provides the wide shot with close-ups of the wearer’s visual focus. I see a day not too far off when everyone will be wearing these spiffy looking things. wtf did he put in her ear?! I can’t wait to wear it on a date. I would only get into trouble if any one but me reviewed the recordings. This could be very useful for marketers to determine exactly what someone see’s first or notices more in an advertisement. This could result in dramatically more effective advertisement… kinda scary really. Why track both eyes? Surely you only need to track one eye to determine direction? @ginge: There are medical uses, as you see in the videos. If, for example, your eyes’ mobility is checked, it can differ between both. @ginge: Actually, you need two. For example, if you tracked one of a person’s eyes moving in towards the nose, you wouldn’t be able to tell if they were looking at something to the side, or if they were focusing on something really close to them. You need to know where the other eye is in order to know that. @ginge: cause one eye isn’t always enough. Some people , myself included , only look in “the proper direction” with one eye at a time, the other one just hovers somewhere. See strabismus. now if only they could control your eye nerve. you could record the good kids reading the book and then force the bad kids eyes to look at every word. Water. Look up Caloric stimulation. Cold water in your ear causes your eyes to quickly move (saccade) away from the cold water and then slowly drift back (nystagmus). Warm water causes the opposite. I’d love to see an open source one of these (maybe made with ps3eye cameras). Hey cool! You did do a writeup on that. Neat. Well, this is really pretty cool. The applications for augmented reality are mindblowing. I would much rater wear a pair of glasses than put an electric contact in my eye. The software just needs to be a little faster or people are going to start getting motion sick and have seizures with all the jerky video. Now you can take video of all the women who will never, EVER sleep with you. This reminds me off all the targeting systems in Gundam and the like anime, how they just look at something and it targets it :D just an idea. Nicely done, especially the tracking seems very precise. This can be easily adapted to control a computer’s cursor on screen: just detect the screen corners in the 3rd eye camera and project the focus point onto it. Should also work with a WiiMote and just a single webcam on one eye. I tried this once, but 320×240 resolution wasn’t nearly enough. (Also I didn’t use the mirrors and had to look at the eyes at extreme angles to not obstruct the view. Barely precise enough to select something on a 3×3-Grid). That’s exactly what I was thinking- this needs to be combined with 3 laser pointers- and wala, PREDATOR targeting! I can just see women making their husbands(or boyfriend) wear this so they can confront them with solid evidence that they did indeed look at the really hot girl that just strolled by. thanks, I was wondering what’s up with that! This could work with FPS games as well. You no longer need to move the mouse for centring the screen at individual objects in the scene, you simply look at it. Cyclops from X-Men video game anyone? This looks like something quadriplegics could use. Just look at the computer screen, and then blink a pattern for clicks. Eye tracking has been around for some time. I remember a video about 10 yrs ago, where marketers were using eye tracking to see where people were looking at on a TV commercial. but the head had to be held still in a chin rest. This next generation seems much more versatile. too bad you have to have wet ears for them to work. I am not so sure about that, I think I would have to have it on to test it. Have you ever tried to smoothly pan your eyes from as far right as you can look to as far left as you can look (of course without turning your head)? Your eye moves in jerky, non-smooth, motions. Almost stepping across your field of vision. You may be right, but I think it is probably closer to how your eye moves than you might think. The thing I would like, however, is the ability to turn on and off the maginification, or zoom at will. Also, maybe expand the field of view a little. That may all be part of the videos above, I am caching them before I finish the bottom two. I believe that the second video is actually a composite video output with the wide FOV with the target overlaid for demonstration purposes. Not what the wearer is actually looking at. Those are all cameras mounted on her head, no projectors, right? Makes “The Final Cut” a little more plausible. So- can anyone tell us if there are technical descriptions of how these were built- ie, do they have details on how to build these, or the code that runs them? If it’s just a device you can buy with 1000’s of $, I’m not interested. But if this is as simple as it looks, it could be implemented for hardware hackers. One question- why not have the cameras reading the reflection at 90 degrees to the eye? Why did they pick such a strange wide angle for the cameras? Could this not be done with smaller cameras, and right over the eyes, without reflection? Now put it in a helmet so people can’t see what I’m recording for future uses. Hmmmmm…. If you could make one of these on the cheap, as I suspect you could, it would have some very real potential paired up with one of those hacked EEG games like the Mindflex or whatever. Also, on the idea of playing FPS with it, I believe it would be rather easy. As long as you keep your eyes on the target, it should work just fine. Granted, it would take some time to get used to, but I think it would work quite well in the end. It reminds me of the Terminator. There are a lot of medical applications for it though. I’ve looked into eye-tracking as an input device. IMO, it is frustrating to use for an able-bodied person used to a keyboard and mouse. It’d probably be useless for an FPS. Just think about how you view things normally on a computer screen, you use your peripheral vision a lot and an eye tracker would not be able to determine that. Keeping your eyes focused on your target would probably be detrimental to your play, it’d effectively be tunnel vision. Also, your pupil doesn’t sit still, it jitters, so that would make accuracy really sub-par when compared to a good mouse. what kind of cameras has used?